While there are some truly superb French restaurants in Melbourne, sometimes at MyFrenchLife™ we like to get away from the city and enjoy the crisp air and stunning local produce on offer in country Victoria. And that’s exactly what award-winning Source Dining (formerly Annie Smithers Bistrot) is all about: the best local produce combined with classic French techniques and aesthetics. 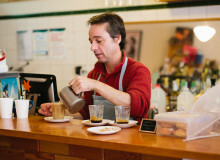 Kyneton, a historic gold-rush town an hour out of Melbourne, is fast becoming a foodie mecca and popular weekend escape. 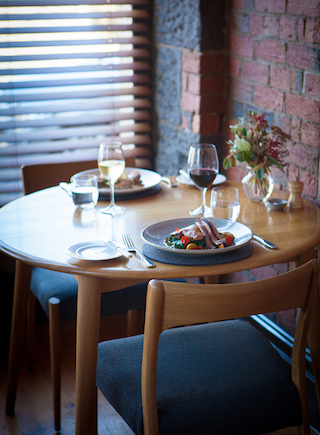 Located on Kyneton’s popular Piper Street, Source Dining is one of Kyneton’s best known and most loved restaurants. This French high-end bistro has regularly received a chef’s hat and glowing reviews in The Age’s Good Food Guide. 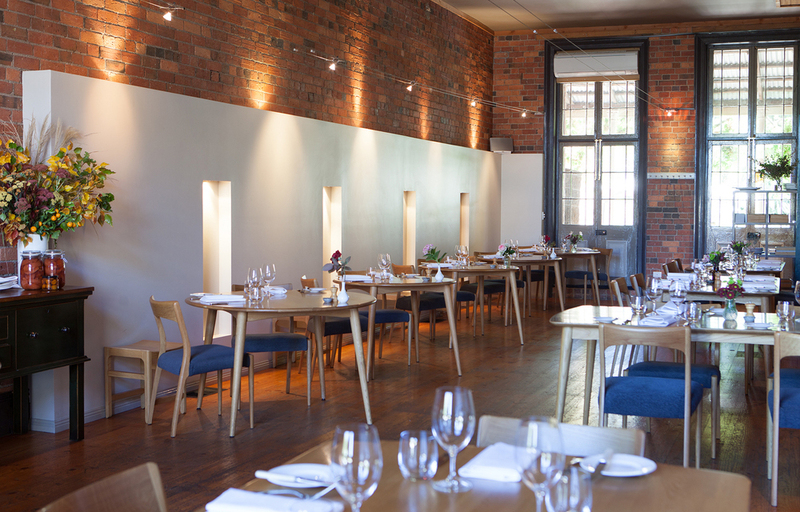 The cuisine at Source Dining is classic and yet modern, with locally grown and sourced produce at the heart of each dish. 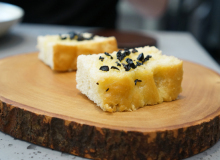 Speaking to owner Tim Foster, who took over the restaurant about two and a half years ago with his wife Michelle, Tim explains that “the source of our product is where everything starts”. Source Dining has its own small kitchen garden on site, a recently established stone fruit orchard nearby, nearly an acre of vegetable garden and relationships with a number of meat producers in the region. The source of our product is where everything starts. When this MyFrenchLife™ writer visited Source Dining, on a particularly cold Saturday night in the middle of winter, we enjoyed seasonally driven dishes like roasted pumpkin gnocchi with fried sage, silverbeet and crème fraiche and slow cooked lamb with brussel sprouts and lentils. The service was warm and full of country charm, rather than the usual standoffish style of Parisian waiters. They happily accommodated our requests and questions and enthused over the wine list with us. Being a sweet tooth, dessert was a real highlight for me. The dessert selection is again quite seasonal, with true winter flavours like dark chocolate, quince, honey and apple featuring heavily on the menu. For my partner and dining companion, the slow cooked free-range old breed pork belly (a mouthful in itself) with pear puree and crackling was a winner. The dishes at Source Dining are beautifully and cleanly presented on the plate. 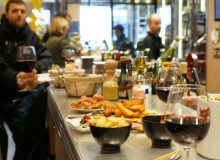 Owner Tim explains that the appealing aspect of classic French cooking techniques is the history behind them – they are “taught today in a very similar way to fifty years ago”. There’s no molecular gastronomy at Source Dining, just truly delicious French style dishes using modern presentation. Currently, Tim’s favourite dish on the menu is the confit free range duck leg. Confiting the leg and brining and then roasting the breast means multiple classic techniques in one dish. Combined with flavours Tim describes as “very regional”, like quince and broccoli shoots, it’s a dish that summarises the menu at Source Dining well. Sitting inside this cosy restaurant, with its soft lighting, polished floorboards and high ceilings, enjoying the last few bites of your apple tarte tatin with spice ice cream, you might actually start to believe you are in the French countryside, and all without the jetlag! 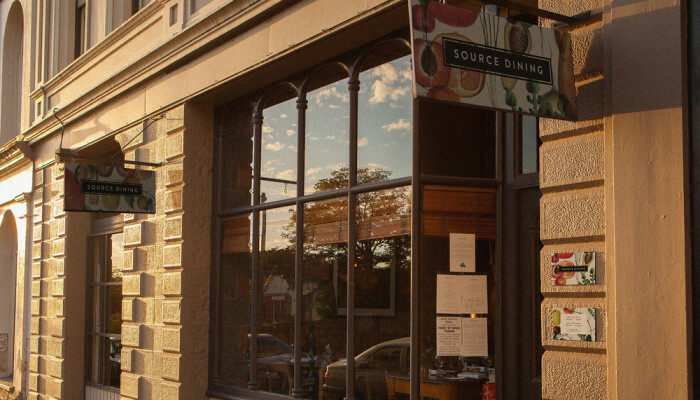 Source Dining is located at 72 Piper St, Kyneton VIC 3444 and is open Thursday – Sunday for lunch, and Thursday – Saturday for dinner. Bookings are highly recommended. Love the country? Love French food? 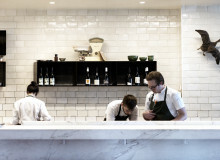 Are there other French dining gems like Source Dining outside of Melbourne that we should know about? Let us know about them in the comments below! All images courtesy of Source Dining. 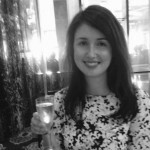 An escapee from corporate law, I now work for an international charity and freelance as a travel and lifestyle writer. 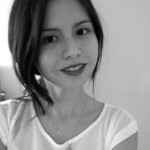 I'm based in Melbourne and when I'm not dreaming of Paris, I'm blogging about everything north of the Yarra at northmelbournelife.com. You can also find me on Instagram (@hannahbfoster) and Google+.